This year will be the first time that we put together an Easter basket and do an egg hunt. Last year was a bit stressful, even though we did attempt to go out. I just finished putting together and ordering items for Alexis’ Easter basket so I figured I’d share, in case someone is searching for ideas that aren’t candy or cheap toxic toys. 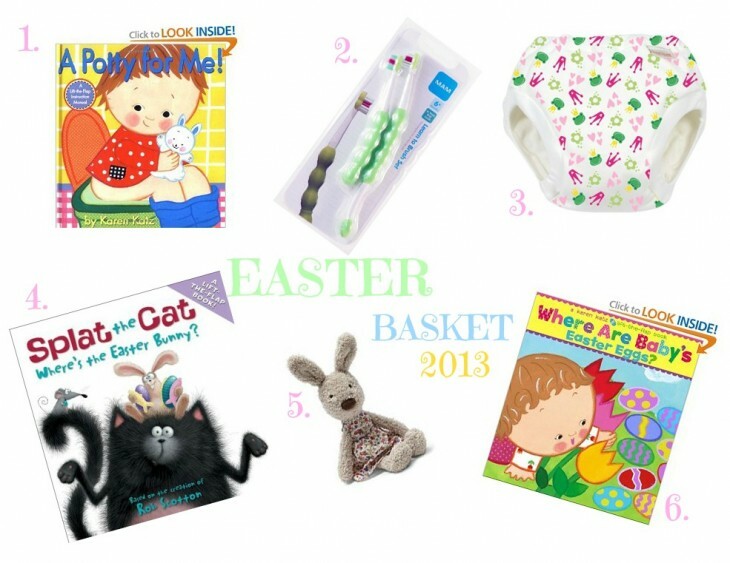 We are about to embark on a potty learning (I do not like using the term training, but I occasionally do use it because it’s an accepted term) journey so I thought it’d be a great opportunity to get her some potty books and training undies for it in her Easter basket. 1. A Potty For Me, a Lift the flap potty book that any toddler will surely love. 2. MAM training toothbrush. One with an extra long handle to have the parent help out and one that is small enough for little hands to hold. 3. Cute organic training pants. I bought two pairs. I have no idea what I am dealing with here, but I am sure I will need a lot more once she starts wearing those. 4. Splat the Cat’s Where’s the Easter Bunny? book. A story about a cat trying to decide what he wants for Easter. 5. A Jellycat bunny (duh!). Jellycat has some of the cutest stuff animals, this one is small and cute. 6. Where are Baby’s Easter Eggs? book. Alexis loves her where’s baby‘s belly button lift the flap book from the same series, so this will surely be a hit. Pastel or spring colored outfits. Lexi is wearing a top and short from Rightbank Babies (purchased on Zulily). Fun colored bows. We love these ones from Hopscotch Boutique. I bought a ton of different colors from it just a few weeks ago, otherwise I’d definitely include them into her basket. Spring and Easter themed shoes. I am obsessed with Livie and Luca spring designs, like the ones on Alexis’ feet. As far as sweets, I might give her a taste of peeps or make my own healthy ones using this recipe. She hasn’t been too crazy about sweet things, so I doubt she’ll be very interested. P.S. As far as potty training, I am sure I will be receiving lots of questions, so yes, a post is coming once some of the potty learning is underway. I am using Pantley’s “No Cry Potty Training Solution” as my guide and expect to take it very slow and based solely on her cues. The book has great tips on pre-potty training, as well as a quiz (yay! 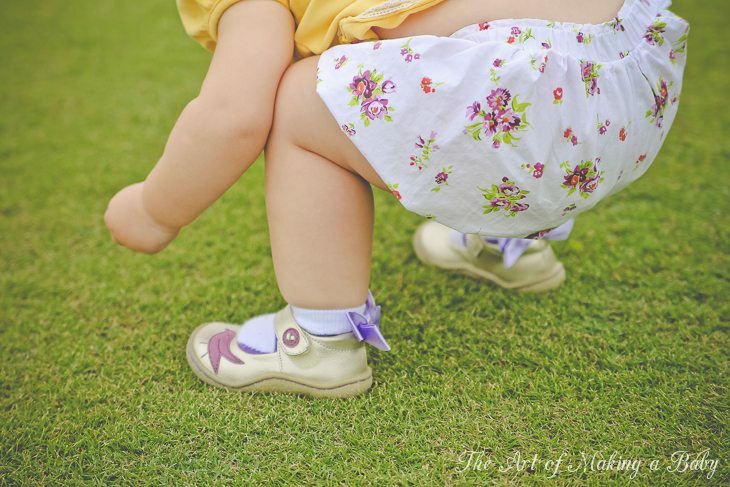 a quiz haha) to determine if your baby is ready for pre-potty training or full potty training. Just a note: this is not “potty train your baby in three days”. It is meant to use as a slow and steady, maybe taking up to a year potty learning guide. When we first started with Garrett, we did no bottoms at all. It was just easier in the beginning. 🙂 Excited to hear how that goes for you. I’ve heard of people doing it with really young children and having great success. I have to wholeheartedly agree with this, you don’t want to risk health issues down the line by starting potty training too early. All the scientific research shows that the human body isn’t even physically capable of purposefully withholding urine or feces until the age of 18 months at the very, very earliest. I’ll always look to my mom as a great example (she was very progressive for her time!). With my brother, she just kept asking him (in a very low-key way) if he wanted to try. He kept saying “no” until one day (close to his third birthday) when he said “yes.” And by the end of that day he was fully trained – no accidents, no pull-ups, no problems at all from that day forward. Completely stress-free! I don’t think anyone in their right mind would expect an under 18 months old to be able to hold it. Up until the age of 18 months to 2.5 years, it’s all about “potty mananagement”, i.e. recognizing the signs and bringing them to a potty and encourage them to use it. Only between that age do they become capable of recognizing when to go potty and holding it enough to make it. And some aren’t even ready past that. I’d like to reserve the discussion about potty training till the appropriate post,though. Easter basket isn’t where we should talk about this. We’ll resume in a few weeks. We did potty training (don’t care about terms), over a few months starting at 15 mos. it went really well, and she asked to use the toilet on her own at 19 months. She was fully trained by 22 mos. we always took it slowly and let her call the shots. We also never needed treats or bribes and she was pretty enthusiastic. I love that she is not using diapers, we CDedbut they still used up a good amount of h2o to maintain. Good luck, take easy and no stressing. I know that’s how you are with her too. Haha yeah we were all potty trained by 1 year 2 months. They did it by simply putting us on a potty regularly. Eventually we caught on. I’ll be doing a similar approach- no rewards, just learning and playing. When she’s ready she’ll get it. I love the shoes so I went to their site to see about ordering some for my granddaughter. But $54. for shoes for a toddler? That smacks of insanity. Yes! That is very expensive! That is one of the reasons I wait for either sales, or till my favorite brand goes on Zulily or Myhabit! 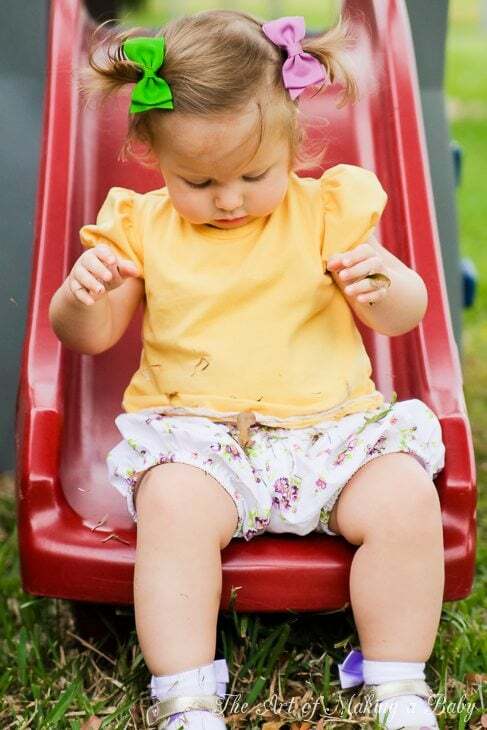 What is all over Lexi in the picture of her on the slide? It looks like chocolate! Not sure what you’re referring to? Are you talking about the leaves all over her? 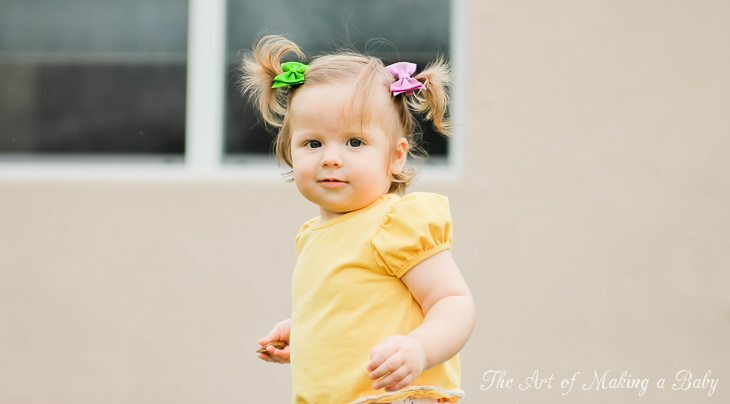 OK, I know you said you will do a potty learning post in a few weeks, but I am looking for potties for my 13-month old right now because I want to start potty learning in the next couple of weeks… and was wondering if you have any suggestions? There are so many options! I have decided on these two potties for the time being: 3 in 1 Potty and a potty bench. Out of all the potties I have looked int they seem like either the most versatile or the most comfortable. I’d recommend against getting a musical one for such a young child since it can be distracting.